Singer 117 Featherweight II bobbin case bracket2. Will adjust for First Class Ship. Singer 117 Featherweight II part3. Will adjust for First Class ship. Singer 117 Featherweight II presser foot thumb screw. Will adjust for First Class Shipping. Singer 117 Featherweight II bobbin case bracket1. Will adjust for First Class Ship. Singer 117 Featherweight II dial1. Singer 117 Needle plate. Note: this does NOT come with the plastic slide plate, but you can buy one here. 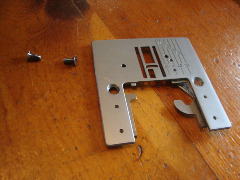 Singer 117 Featherweight II tension assembly. Needs to be reassembled on machine.